On Saturday morning I was up early, Wader twitchery on my mind. Rubbing the sleep from my eyes it seemed that the bird-feeder looked a bit different. Blinking a few times I looked again. Yes, it has definitely changed, but how? Wait a minute! I've got it. 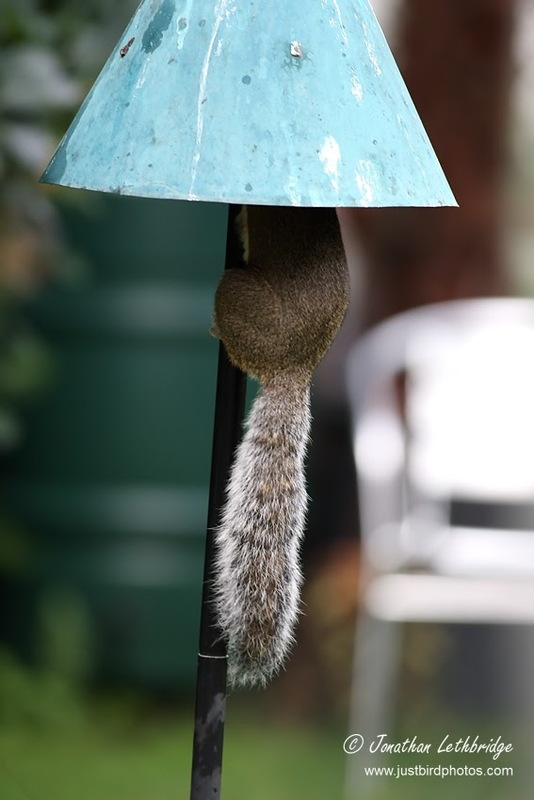 The feeder has got....a tail. Huh? Gah! It's that bloody squirrel again! 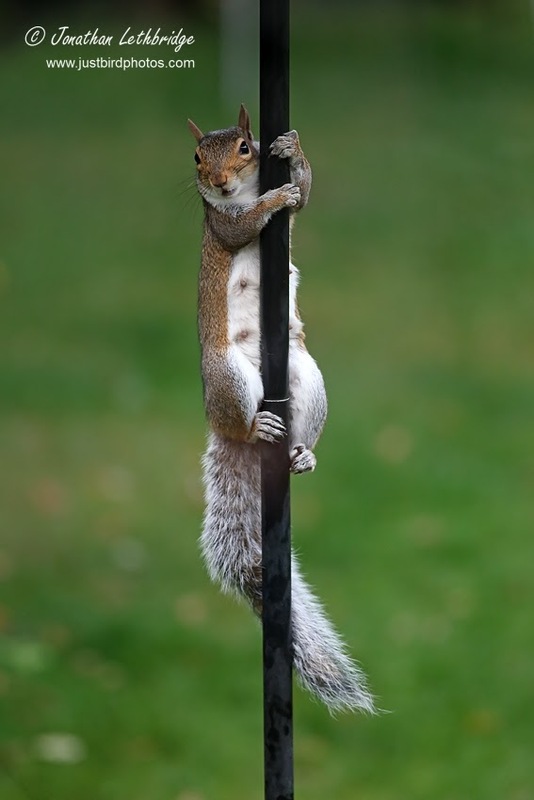 As I watched, it attempted to get around the baffle and then when it noticed me slid down the pole a short distance. "Yeah, what are you looking at? I'm just hungry OK, I'm always hungry. Those Monkey Puzzle seedlings you carefully grew and that I uprooted and ate the other day were no good. Well, maybe the eighth one was alright, but its peanuts that I really want. I just want peanuts. I can see them and I can smell them, and frankly this cone thing is a right pain. No, no, don't take it off. You see I am going to beat it, you know it and I know it, it is just a question of when. I want that satisfaction and I want to see the look on your face when you realise I've done it. I'm going to be going now so don't bother opening the door and trying to scare me, but I'll be back. I'm driven by constant and insatiable hunger, and that's a very powerful motivator. You've got to go to work on Monday, and as soon as you do this is where I'll be. I reckon I'll have it cracked by Tuesday, so fill her up loser!" 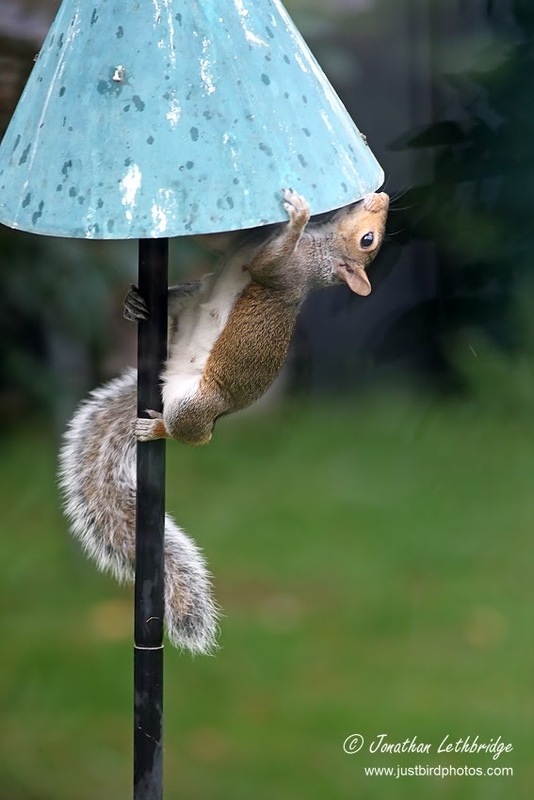 And then it slid the rest of the way down the pole and sauntered off down the garden.